vegas-hotels-online.com constantly verifies and updates the information on its websites. Despite all care taken, the data may have changed since its time of publication on the web. vegas-hotels-online.com therefore assumes no liability and makes no guarantee for the up-to-dateness, correctness or completeness of the information made available. The same applies to all other websites that have been referenced by hyperlinks. 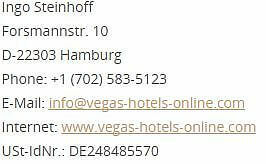 vegas-hotels-online.com is not responsible for the content of the linked websites. vegas-hotels-online.com also reserves the right to make changes or additions to the information provided. We attach great importance to privacy. The collection and processing of your personal data is carried out in compliance with the applicable data protection regulations, in particular the General Data Protection Regulation (DSGVO – hereinafter “GDPR”). In doing so, we or our hosting provider processes inventory data, contact data, content data, contract data, usage data, meta and communication data of customers, interested parties and visitors to this website based on our legitimate interests in an efficient and secure provision of our website. article 6 paragraph 1 p. 1 f) GDPR i.V.m. article 28 GDPR. We reserve the right to retrospectively review the log data if, on the basis of concrete evidence, there is a legitimate suspicion of unlawful use. We store IP addresses in the logfiles for a limited period of time, if this is necessary for security purposes or for the provision of services or the billing of a service, eg. if you use one of our offers. After termination of the order process or after receipt of payment, we will delete the IP address if it is no longer required for security purposes. We store IP addresses even if we have a specific suspicion of a crime in connection with the use of our website. In addition, as part of your account, we save the date of your last visit (for example, when registering, logging in, clicking links, etc.). We use so-called session cookies to optimize our website. A session cookie is a small text file that is sent by the respective servers when visiting a website and stored on your hard disk. As such, this file contains a so-called session ID, with which various requests from your browser can be assigned to the shared session. This will allow your computer to be recognized when you return to our website. These cookies are deleted after you close your browser. The legal basis for the processing of this data is article 6 (1) sentence 1 b) GDPR, because this data is needed so that we can fulfill our contractual obligations to you. For the new registration we collect master data (e.g. name, address), communication data (e.g. e-mail address) and payment data (bank details) as well as access data (user name and password). You can have a once created user account deleted from us at any time, without any costs other than the transmission costs according to the basic rates. A textual message to the contact details referred to in point 1 (e.g. e-mail, fax, letter) is sufficient. We will then delete your stored personal data, as far as we do not have to save them for the processing of orders or due to legal storage requirements. The legal basis for the processing of this data is your consent in accordance with article 6 (1) sentence 1 a) GDPR. Legal basis for sending the newsletter is your consent acc. article 6 (1) sentence 1 a) in conjunction with article 7 GDPR in conjunction with § 7 (2) no. 3 UWG. Legal basis for logging the application is our legitimate interest in proving that the shipment was made with your consent. You can cancel the registration at any time, without incurring any costs other than the transmission costs according to the basic rates. A textual message to the contact details referred to in point 1 (e.g. e-mail, fax, letter) is sufficient. Of course, you will also find in every newsletter an unsubscribe link. Legal basis for this is the legal permission according to article 6 paragraph 1 S. 1 f) GDPR in connection with § 7 paragraph 3 UWG. When you contact us (e.g. via contact form or e-mail), we process your details for the processing of the request as well as for the case that follow-up questions arise. If the data processing takes place for the execution of pre-contractual measures, which take place upon your request, or, if you are already our customer, for the execution of the contract, the legal basis for this data processing is article 6 paragraph 1 p. 1 b) GDPR. We process further personal data only if you consent to it (article 6 (1) sentence 1 a) GDPR) or we have a legitimate interest in the processing of your data (article 6 (1) sentence 1 f) GDPR). A legitimate interest is for example, responding to your email. In addition, you can prevent the transmission of the data generated by the cookie and related to your use of the website (including your IP address) to Google and the processing of this data by Google by downloading the browser plug-in available under the following link and install: http://tools.google.com/dlpage/gaoptout?hl=en. 8. the existence of automated decision-making including profiling in accordance with article 22 (1) and (4) GDPR and – at least in these cases – meaningful information about the logic involved, as well as the implications and intended effects of such processing for you. If personal data are transmitted to a third country or to an international organization, you have the right to be informed about the appropriate guarantees under article 46 GDPR in connection with the transfer. 3. In accordance with article 21 paragraph 1 GDPR, you object to the processing and there are no prior justifiable reasons for the processing, or you object to the processing according to article 21 (2) GDPR. 6. The personal data were collected in relation to information society services offered pursuant to article 8 (1) GDPR. If we have made the personal data publicly available and if we are obliged to delete it in accordance with article 17 (1) GDPR, we shall take appropriate measures, including technical ones, for data controllers who are responsible for the personal data, taking into account the available technology and the implementation costs process data, informing you that you have requested deletion of any links to such personal information or copies or replications of such personal information. 1. The accuracy of your personal information is contested by you for a period of time that allows us to verify the accuracy of your personal information. 4. You have objected to the processing according to article 21 (1) GDPR, as long as it is not certain that the justified reasons of our company outweigh yours. 2. the processing is done using automated procedures. To safeguard your data, we maintain technical and organizational security measures in accordance with article 32 GDPR, which we always adapt to state-of-the-art technology.